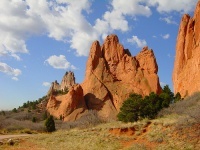 A Colorado Springs Vacation is a great choice any time of year. There is skiing in winter and many outdoor activities and sights to see the rest of the year. 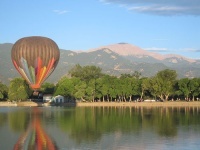 This beautiful city has a fantastic setting nestled below towering Pike's Peak. The many attractions and outdoor activities in the area make for a favorite Colorado family vacation. Colorado Springs has its own airport or you can fly into Denver and it is about 1 1/2 hour drive. Summit House Inn is a lovely Colonial Revival home, intimate, elegant furnishings and reasonable rates. Holden House 1902 B&B - Ph. 719-471-3980, a historic home, with nice amenities and afternoon wine. U.S. Air Force Academy - There is a great tour available of this wonderful campus with lots of information on the school and its history. Don't miss the spectacular chapel! Be sure and check out my other pages on Denver, Rocky Mountain National Park and Vail. Enjoy your Colorado Springs vacation. This breathakingly beautiful part of the country inspired the writing of "America the Beautiful"! 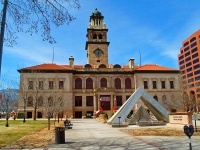 Have you been to Colorado Springs? Do you have a favorite place to stay or activity that everyone should know about? When you return from your getaway, tell us about it. Review the lodging, attractions, restaurants and/or share a photo.